Captain Nuzzo was born and raised in Cleveland, OH. and began his sailing career with the U.S. Coast Guard. From 1968 to 1972 he served at the Toledo small boat station, onboard the Coast Guard Cutter Mesquite and at the Rescue Center in Cleveland. After attaining a rank of 2nd Class Quartermaster he left the Coast Guard to entered the Great Lakes Maritime Academy and graduated in 1976 with honors. Capt. Nuzzo sailed with Ford from 1976 to 1989 and has sailed for Interlake since 1989. He has served as the permanent master of Lee A. since 1992. In 1992 he attended the Port Revel Shiphandling school in France. An avid small boater, he has raced sailboats on Lakes and Oceans and restored a classic wood Chriscraft runabout. When not sailing Capt. Nuzzo enjoys windsurfing and Walleye fishing on Lake St Clair. Capt. Nuzzo lives in Harrison Township, MI. with his wife Carol. In just a few months you and three friends could be cruising the Great Lakes aboard the Lee. A. Tregurtha. The International Ship Masters' Association Detroit Lodge #7 is offering the chance to win a trip aboard the Lee A. Tregurtha to benefit their convention fund. 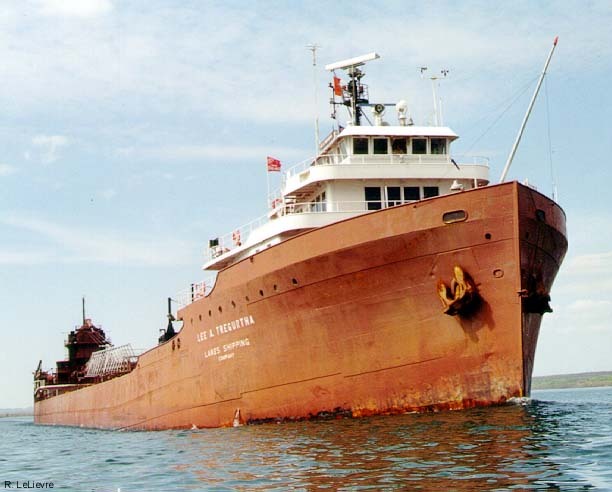 A cruise aboard a lakes freighter is only available to the shipping company's customers and some family members. The only chance for the public to enjoy a once-in-a-life-time cruise is through non-profit raffles such as this. Grand Prize is a trip for you and three friends aboard the classic steamer Lee A. Tregurtha, the largest steam powered vessel on the lakes. The drawing will be held on July 4, 2000 and the trip will take place in August 2000. Departure port & dates will be coordinated with the winner. Your ticket(s) will be promptly mailed to you. Tickets are also on sale at the Mail Boat station and Dossin Museum in Detroit. If you are the lucky winner you and three friends will enjoy a cruise aboard the Lee A. Tregurtha this August. The Tregurtha spent the winter undergoing numerous improvements and upgrades including a new paint job.